I was surprised to discover some American idiosyncrasies that were so ingrained, I didn’t even know they were in there. Around Halloween, I typically make sugar cookies shaped like candy corn. While Halloween isn’t a big deal in the Netherlands, it is acknowledged. So when I went to a late October coffee morning at a friend’s home, I brought my cute little cookies. The ladies were polite and said my colorful, triangle-shaped confections tasted nice. 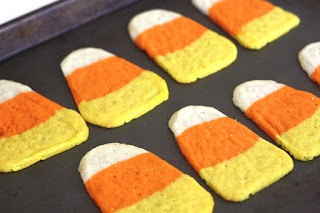 It wasn’t until later that I realized everyone else at the get-together was European, and not one of my friends knew what the cookies were supposed to represent -- they’d never seen candy corn in their lives! Apparently, candy corn hasn’t made it across the Atlantic. Who knew?